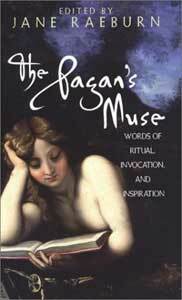 Order The Pagan's Muse and related books here! Who needs poetry? Teachers and librarians hear that question every day. For those of us who follow a group of faiths loosely labeled "Pagan," the answer is easy: We do. In most of Western society, poetry is marginal at best. For those who practice Pagan faiths, poetry is essential. There are many books of ritual, but no standard liturgy. It therefore becomes our right and responsibility to craft our own rituals. We must choose words that connect us to the Divine, nurture our spirits and challenge us to become more aware. This is what poetry does. One of the common threads that ties the varied and sometimes conflicting paths of Paganism is the necessity -- and, indeed, the freedom -- of creating our own rituals. Even the most tradition-bound group must craft its ceremonies at least once. Even those whose historical roots are thoroughly documented must choose translations and sections of ancient texts that best -- most poetically -- reflect their purpose. Unlike members of more conventional faiths, we need not -- often cannot -- follow along in the book, sticking comfortably to another's words. The words we choose must be our own, must therefore come from within us and reflect the truths and desires of our own personal spiritual experiences. It's a powerful responsibility. This book is a sampling of poetry for (and in many cases by) Pagans. It has two purposes: First, to offer a helpful resource for the ritual writer, and second, to help inspire those whose writing forms part of their spiritual path. The poems here were selected from hundreds submitted for this book, and from those older works which were suggested to me. The criterion was simple: If a poem inspired me, sang to my soul or my heart, it belonged here. As with any such selection, it cannot help but be subjective and biased. There are many worthwhile poems which are not offered here, simply because space did not allow. The poems here are divided into several sections to assist the ritual-writer. Their names are quotes from the "Charge of the Goddess," by the late Doreen Valiente, perhaps the closest thing to a sacred text in Wicca or Paganism. Some of the poets here may be people you "know" from books and magazines, or from festivals and workshops. Others are seeing their words in print for the first time. Some are longtime, much-honored practitioners of Pagan religions; others are expressing the joys of having just found their spiritual path. Many poets represented here may not be Pagan at all, for they were not required to adhere to any faith, simply to express ideas that might be meaningful to Pagans. All text and images on this site © copyright 1999-2003 Jane Raeburn. All rights reserved. Please ask permission before copying text, links or images.